Against the backdrop of South Africa's 2009 election, which saw Jacob Zuma become the country's third democratically elected president, BEHIND THE RAINBOW is a detailed exploration of the evolution of, and internal conflicts within, the ruling African National Congress (ANC), since it first came to power with Nelson Mandela's election in 1994. The film's focus is on the development over the years of the relationship between two of the ANC's most prominent leaders, Thabo Mbeki - who followed Mandela as president and served from 1999 to 2008 - and Jacob Zuma, who was one of the most important commanders of the ANC's armed struggle against the apartheid government. Exiled under apartheid, they were once brothers in arms (they shared a prison cell together at one point). Under Mandela's administration, they loyally labored to build a non-racial state. But in recent years their duel threatened to tear the ANC apart. BEHIND THE RAINBOW tells their story, one of friendship, comradeship, and eventual bitter personal conflict, with rich archival material and through in-depth interviews with both Mbeki and Zuma, as well as many of their current and former ANC colleagues, such as Terror Lekota (leader of the new opposition party COPE); Kgalema Motlanthe, Mac Maharaj and Ronnie Kasrils; members of South Africa's Communist Party; and many other important players in South African politics and observers of Mbeki and Zuma's stories. 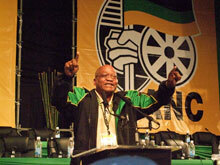 The ANC's transition from a liberation organization into South Africa's ruling party has not been an easy one. Harsh economic inequalities, xenophobic attacks, corruption scandals, strikes and township protests all contributed to Mbeki's fall. 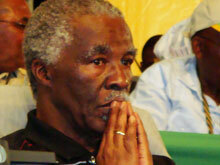 Zuma may have won his battle with Mbeki, but his government is now facing the same problems. In recounting South Africa's recent political history, BEHIND THE RAINBOW is the story of how Zuma, the ANC, and South Africa, got to this crucial conjuncture. A South African filmmaker travels in a mini-van taxi across his country with a hand-held camera. Topics range over controversial issues such as land, race, language, democracy, identity, and violence. How could 34 South African mineworkers be killed during a non-violent strike for better wages... not under apartheid, but today?